Note: Sources for our data are listed at bottom of page. As of 2017 most of these folks are still too young to have made an impact. However the older ones might be fighting our war in Afghanistan. The younger ones are hopefully still in school and planning on careers and jobs that will have strong demand and generate new opportunities. I'm personally optimistic about the iGen'ers. Whereas Millenials were raised to think they were special and that they could become anything they dreamed of, and then after graduating they found that Boomers had let millions of jobs slip out of the country, iGen'ers have seen this, and are far more cautious and less optimistic and maybe less naive. Our free personality test will help you understand what careers are a better match for you. It will also show you how to understand people better. If you are iGen and looking for a career, please pick a major in fields where there will be plenty of jobs and avoid fields where the jobs are limited. Unless of course you are so different and truly one of a kind like: Michael Jordan, Prince, The Beatles, Albert Einstein, Bill Gates, Elon Musk, Kim Kardashian (just kidding). You have two choices - pick a trade or get the right college education. Low skilled jobs will continue to disappear and you can not raise a family on the income from a low skilled job. You either need skills or education. There won't be many jobs for people who major in English, history, philosophy etc. Sorry. If you want help choosing a new career, or making those big career decisions, check out my career counseling services. Civil Engineering offers very few jobs since we are not building a lot of bridges and buildings. So avoid that. Automotive engineering is tough. Not many US jobs except in the electric car field. Jobs that must be done in person such as plumbers, electricians, barbers, beauticians, should still be in demand, although lower paying than jobs requiring a college education. The trades are more stable than many other careers. Sales jobs will continue to shrink. Retails sales jobs are disappearing as shopping malls close and as Amazon takes over the world. Sales people are usually just middlemen. Who needs them? Sorry... However, sales people that do business development and find new customers are a different story. But the days of being a shoe salesman in a mall store are gone. Business development and marketing are still good fields, but will see some unexpected changes. The auto mechanic field is going to go through interesting changes with the growth of electric vehicles and self driving vehicles. EV's have less moving parts and fewer fluids to replace, but they still need tire changes. Taxi driver jobs and truck driver jobs will start to experience less demand as automated vehicles take over. However, as of 2018, the demand for truck drivers is booming. As automated electric vehicles take over, the need for individuals to own a car will be reduced. It will become more simple, less expensive, and more efficient to just walk outside, call up an app, have a driver-less Uber pick you up and take you to wherever you want to go. As long as a car can show up in 5 minutes or so, that will be the way to go. Owning your own car is not efficient, nor a good investment. Cars sit around doing nothing for 98% of their existence. They take up space, they consume your money on insurance and repairs even while they are just sitting doing nothing. How this will affect jobs, careers and the workplace will be interesting, and iGen'ers will be the first to experience this. Space flight related jobs will pick up as we focus on getting people to the moon, Mars, and space stations. Geology jobs, especially related to finding minerals on other planets should see a rise in demand. Virtual Reality related jobs (whatever those are?) will pick up as VR technology becomes ubiquitous. Probably creating VR experiences will be popular. The generation after the iGen'ers will be the ones who grow up thinking virtual reality is normal. The cohort known as "Xennials" are composed of the oldest Millenials. This is a "crossover generation." Born roughly between 1975 and 1985 plus or minus a few years. The idea being that Xennials are more like the preceding Gen X than they are like Millenials. According to Australian Sociologist, Dan Woodman, "The theory goes that the Xennials dated, and often formed ongoing relationships, pre-social media. They usually weren't on Tinder or Grindr, for their first go at dating at least. They called up their friends and the person they wanted to ask out on a landline phone, hoping that it wasn't their intended date's parent who picked up." According to WikiPedia, Gen X was originally called "Gen Bust" because their birth rate was vastly smaller than the preceding Baby Boomers. 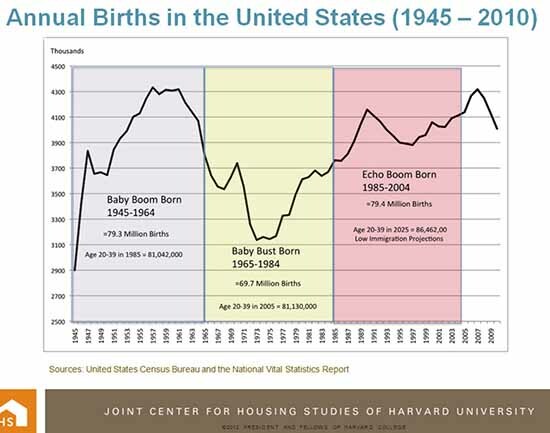 Baby Boomers are defined as being from the huge population increase that followed World War II, and the Great Depression. Those of the Silent Generation were born during the Great Depression. Their parents were mostly of the Lost Generation. Those of the Greatest Generation grew up during the Great Depression and probably fought in World War II. They are also known as the GI Joe Generation. Why the Overlap in Dating Generations? In the USA, there are two different methods for marking the borders between generations. At CareerPlanner.com we have recently chosen to use the cultural method rather than the birth rate method for deciding when a generation begins and ends. The reason is that we are more interested in the cultural events that shaped a person's thinking. What Generation Are You If You Are On The Cusp? If your birth date falls on the border between two generations, which one do you pick? On 10-21-2017 we added info on iGen, and changed their start date from 1996 to 1995, and changed Millennials end date from 1995 to 1994. To be consistent with Jean Twenge PhD's work. Also changed iGen end date from 2010 to 2012 for the same reason. On 10-7-2017 we start to refer to Gen Z as "iGen" based on a book by Generation researcher Jean M. Twenge PhD. On 8-11-2017 we added a section on Xennials. On 5-30-2017 I clarified that the weapons of mass destruction the Bush Administration lied to us about, was of the nuclear and biological types. They did find chemical weapons which are considered WMDs (I did not know that), although that's not what scared us into war. It was the fear that Iraq could use nuclear and bio weapons against us. They already had a history of using chemical weapons against their neighbors and their own people.